When it was announced that Bob Dylan had been awarded the Nobel Prize for Literature there was a substantial reaction asking if songs could be literature—no, that’s not right, I’m mischaracterizing much of the reaction I read as if it was an honest inquiry into this question. No, the reaction I read was more of a conclusion that songs could not be literature, and so this Nobel award to Bob Dylan was a break with tradition, a loosening of standards. This is complex subject, one I’ll probably return to, as I have much to say on this; but missed in the hoopla and questioning was this fact: Bob Dylan was the second singer/songwriter to win the Nobel Prize for Literature. “Because of his profoundly sensitive, fresh and beautiful verse, by which, with consummate skill, he has made his poetic thought, expressed in his own English words, a part of the literature of the West”. 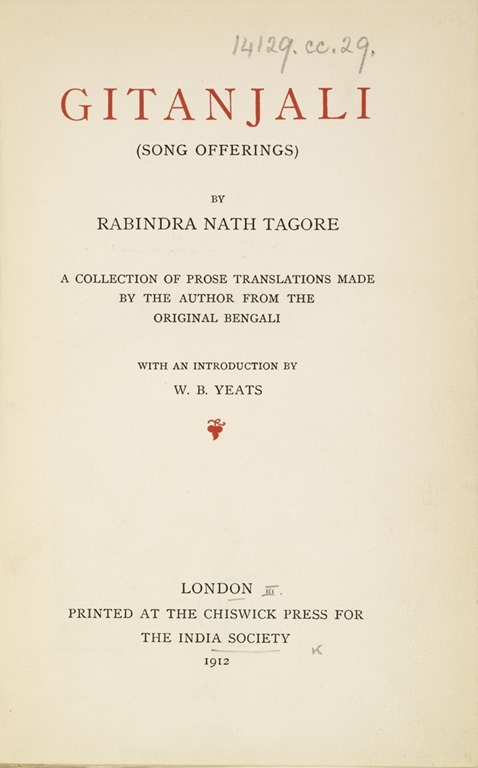 In 1913 when the prize was given, Tagore had only one such work they could be talking about: “Gitanjali,” a 1912 collection of his song lyrics that Tagore had translated himself from Bengali into English prose poems. 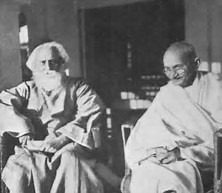 Tagore is a fascinating man and artist, with achievements in so many fields that you might think I’m making him up. He wrote every kind of literature, started a university, seriously pursued modern painting, and gave Gandhi the title “Mahatma.” But he was no dabbler at songwriting, having written over 2000 songs. He’s even the only composer to score a hat trick for national anthems, having written the national anthems of India, Bangladesh and Siri Lanka. His songs are so pervasive in Bengali culture that his thousands of songs have become their own genre. This spring as I read Tagore’s “Gitanjali,” I hoped to find there on the page what is promised in Yeats’ introduction and what would normally be guaranteed by such acclaim. I failed at this. I couldn’t find it. The English of the prose translations seemed so archaic, the expression stilted, the voice vague. From accounts I’ve now read, this seems to be an acknowledged problem; and it appears that, for whatever reasons, Tagore purposely framed his translated work in an incomplete way. In the longer term, I will seek some of the newer translations. In the short term, I stood back and remembered something. Not only are they missing their music, but songs, like plays, are works for individual voices and talents to embody. Their creators are not claiming the real, complete thing exists on the page, that they are performing them mutely with ink on the white page. No, they expect, demand, that someone step in them, surmise their meaning, fill the blank white space with emotions, and speak them. All art is like this really. Songs admit it. Songwriters generously say: I need you to fill these things, your humanity is better than any of my approximations. So, today’s episode is the second of my attempts to bring something to a piece from Tagore’s “Gitanjali” using his original prose translations, as that’s all I have for now. With the last post here, “Light,” I tried to meet Bengali music partway, but this time I’m staying firmly in the Western side, maybe even a bit on the Country and Western side. As I read this piece on the page I heard it as sounding like one of those weird Lee Hazelwood arrangements from a few decades ago, but since I was producing this myself, I had to sing the Nancy Sinatra part as well. If you wonder about the floating light ceremony mentioned in the song I call “Maiden with a Lamp,” it may be this one. To hear me perform my vaguely C&W version of “Maiden with a Lamp,” use the player below.